So after a rather late, midge plagued car camp at a spot in Glen Orchy, we arrived at Cruachan to do the ridge. The weather forecast was promising, but overnight rain was being slow to clear. The visitor centre had signs up saying the car park is locked at 5.45, so we parked on a muddy layby next to the railway station. We set off, up the steps toward the station, taking the blue gate to go under the tracks. The path continues up big brick steps to an electricity substation, but a wee path up to the side started heading steep uphill and was reassuringly well trodden. It wasn’t until a bit higher up we realised the path on the map goes up the other side of the burn. The path we chose was interesting underfoot, and wove through the forest and high bracken with hardly a view of anything. 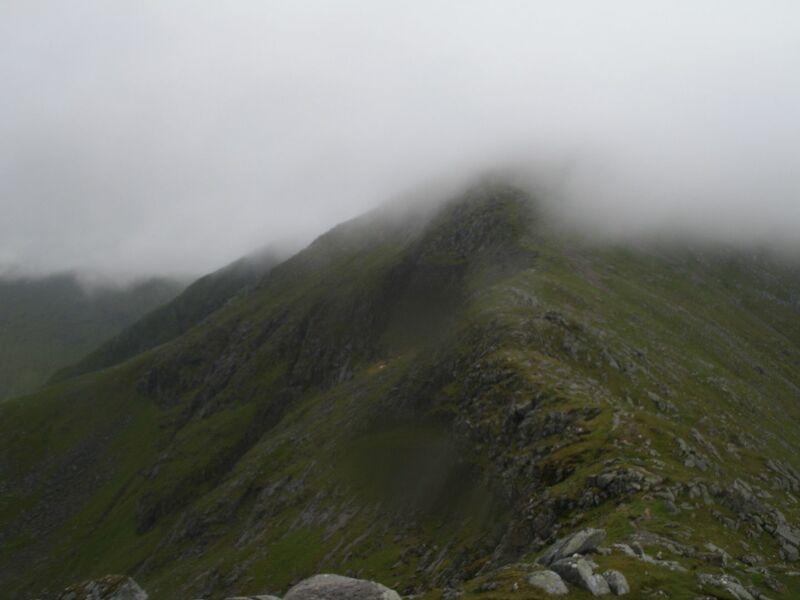 We heard the Cruachan falls but certainly couldn’t see them. Up above the trees, there was a stiff breeze which aided our ascent – so good not to be literally wilting on a walk like I have been of late. After a big crooked stile took us over the deer fence, the incline got a lot less steep and the views started to open up. 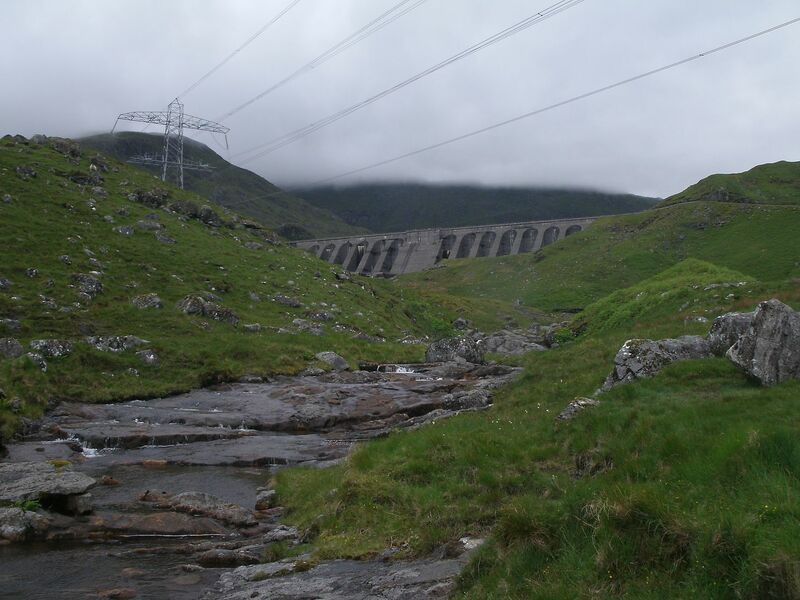 The Dam came into view looming on the horizon, the hills behind unfortunately still in clag. 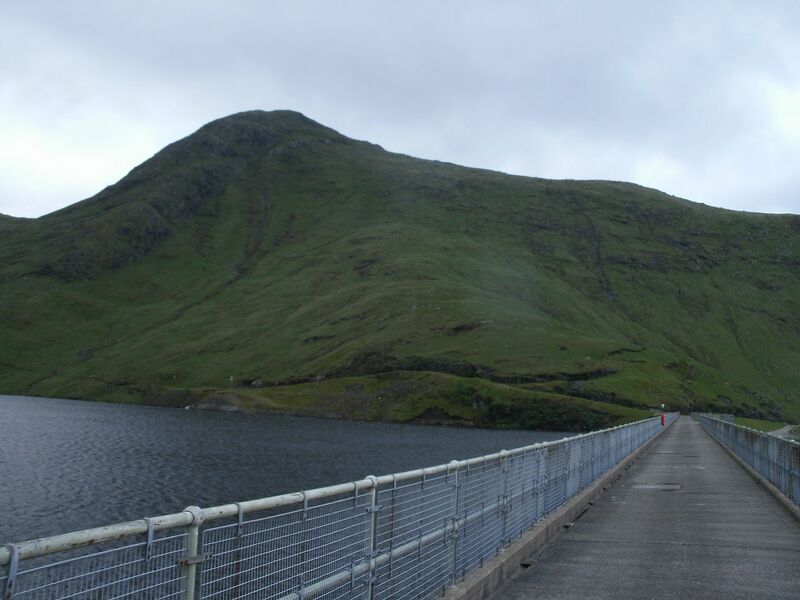 We reached the wee hydro road, went up to the left a bit and then up a grassy bank to a huge metal ladder which took us up onto the dam. It was really windy, so we hunkered down behind a wall for a while for a snack. The track down the loch only took a few minutes then a path headed up left – boggy at first, but improving underfoot somewhat as we got a bit higher. 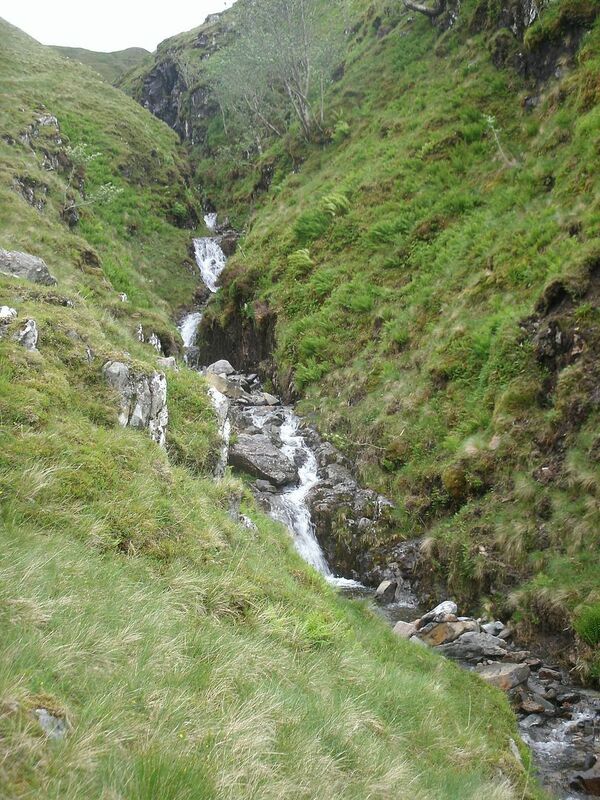 It was a really lovely wee corrie, with many streams and waterfalls to take our minds off the stiff climb. 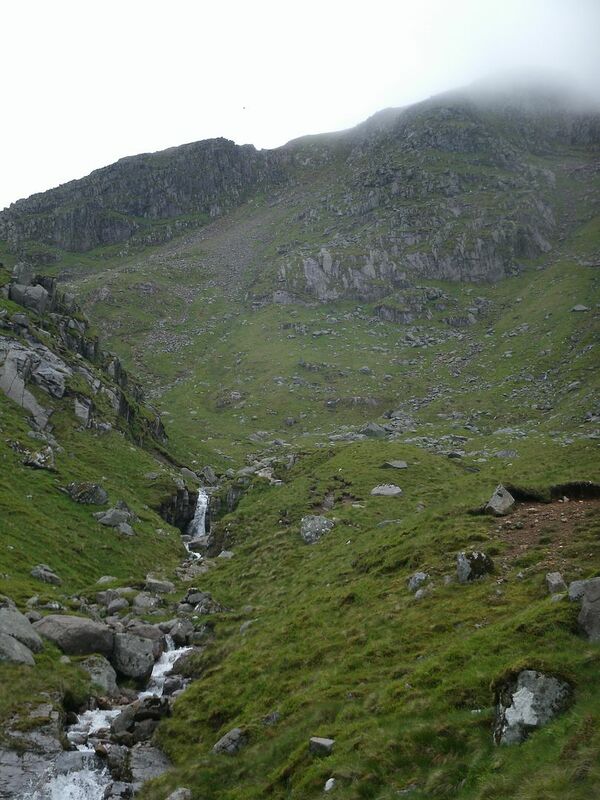 The usual eroded zig-zags took us up the end of the corrie to the ridge, just below the clag line. 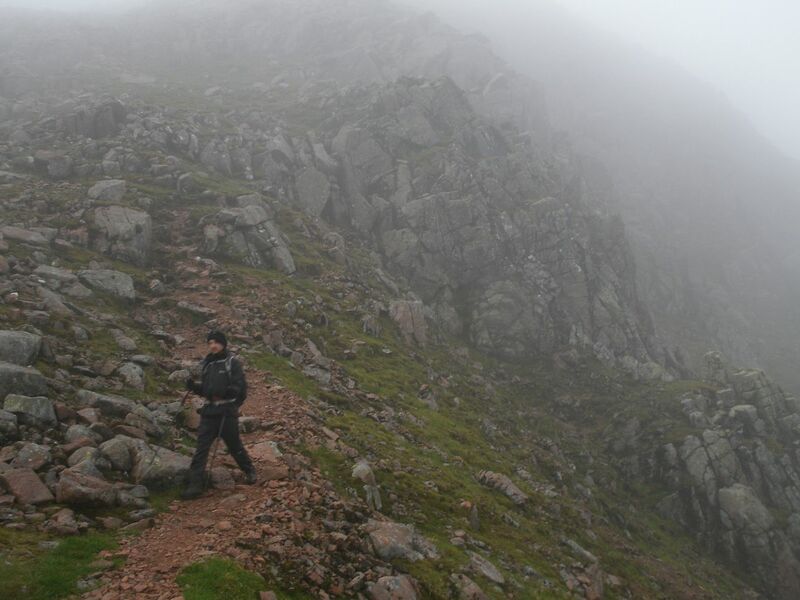 A steep rocky section, led to another, then another – so many false summits! 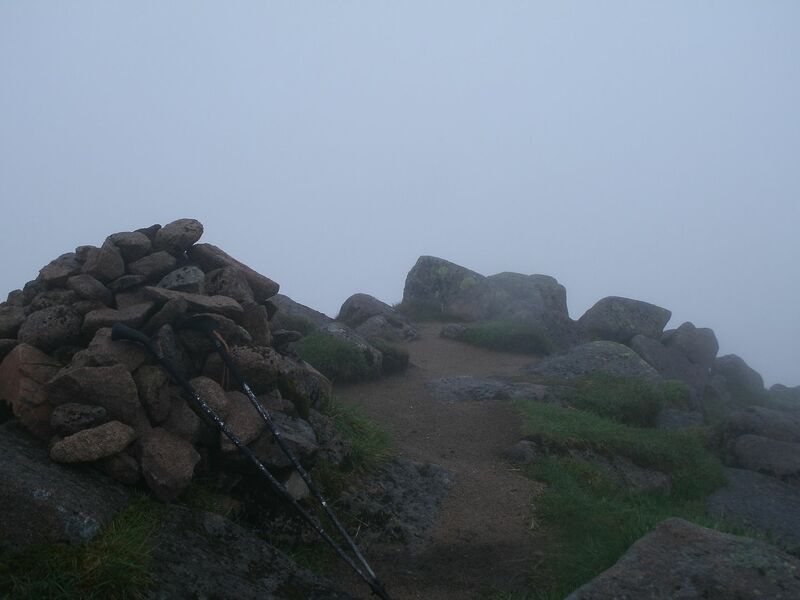 Eventually, the broken trig and cairn were reached. 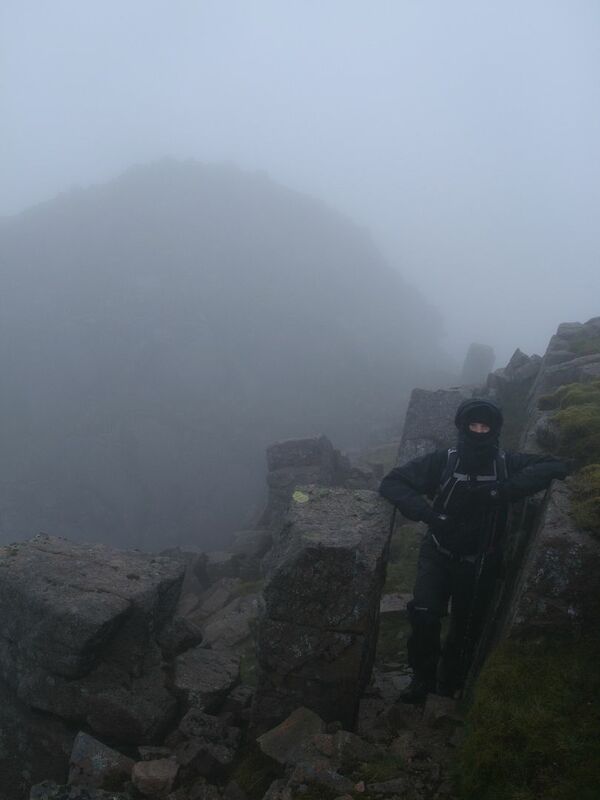 Brrr, really cold and windy up there – so we huddled out of the wind, in amongst the rocks near the summit for a break. 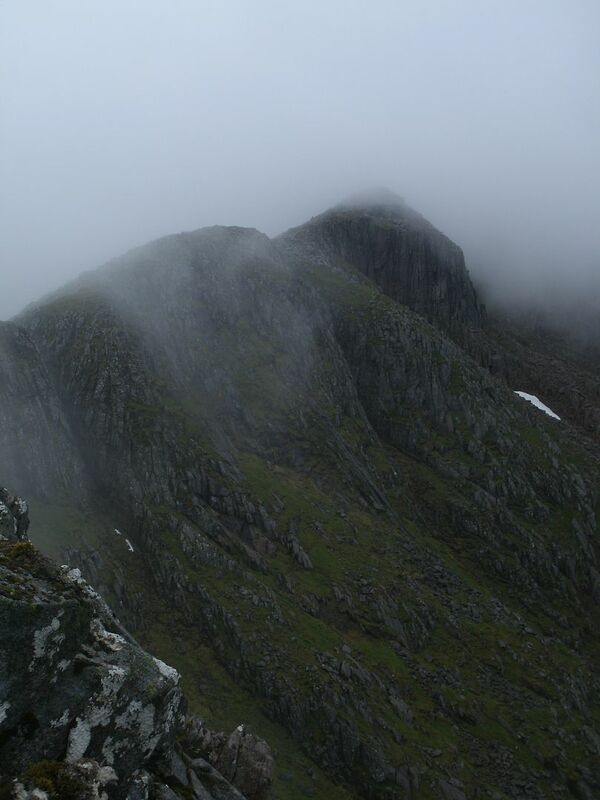 We continued along the ridge, a couple of wee scrambles necessary. At one point I couldn’t see the way forward at all, until Dougie pointed out the rather large path off to the right – Darn this clag! We reached a big steep slab in our path. I put one foot on it and slipped straight away in the wet..
Hmm, maybe the bypass path today.. 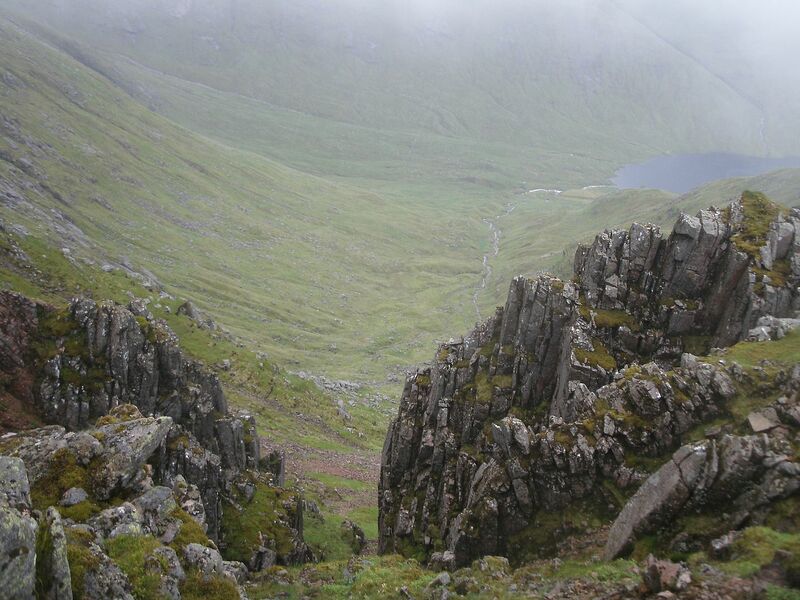 Even the bypass was fun though, across boulderfields, and weaving past wee crags and slabs. We were soon back on the ridge, undulating over a few small tops, seeing occasional tantalising fleeting views of Loch Etive and Starav. Some bits of the ridge were almost too windy for boulder-field hopping, but we made it along fine, with just the odd ‘bracing’ moment. We came across a cairn, and a path down just before a top. 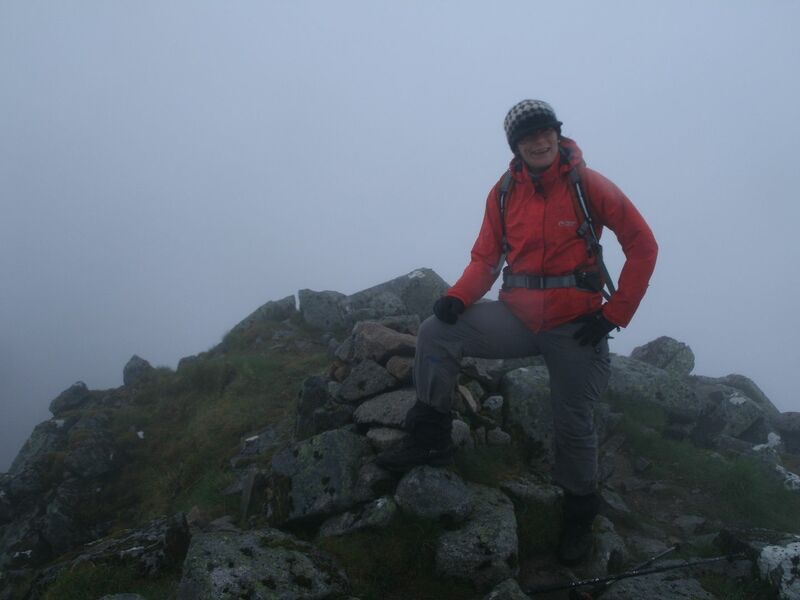 We continued along the ridge a bit – my alarm bells ringing, as the baggers path had developed a moss coating.. We were having too much fun though – what a good bit of the ridge that is! A few hundred yards on though, I told Dougie of my fears that we were going the wrong way.. A quick check of the map told us we were heading down Drochaid Ghlass.. 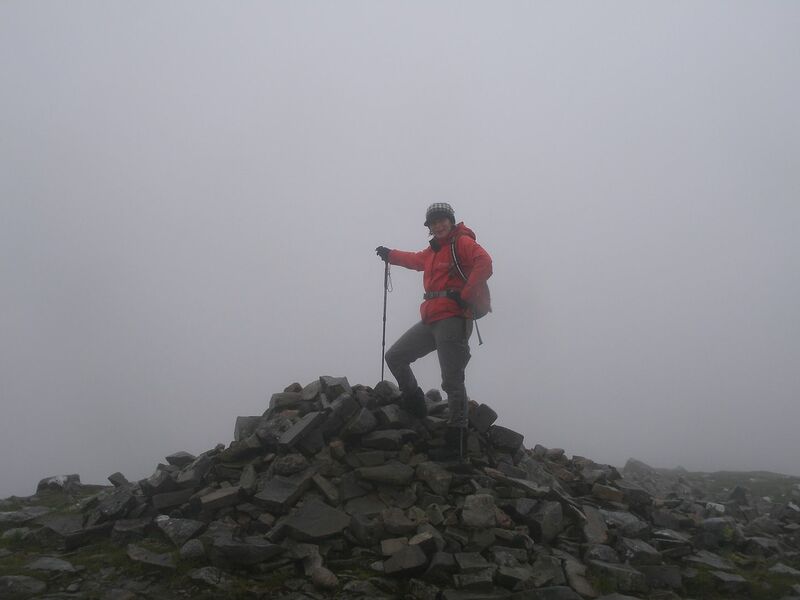 So nothing to do but the really cool bit of ridge again back to the cairn – what a hardship! So down the baggers path, steep and eroded, down to much grassier slopes and finally getting down below the clag for a bit. so we headed onward, making extra sure we got the right ridge this time There were a couple of tops along the ridge, one we climbed, the next we bypassed, looking for the path down. 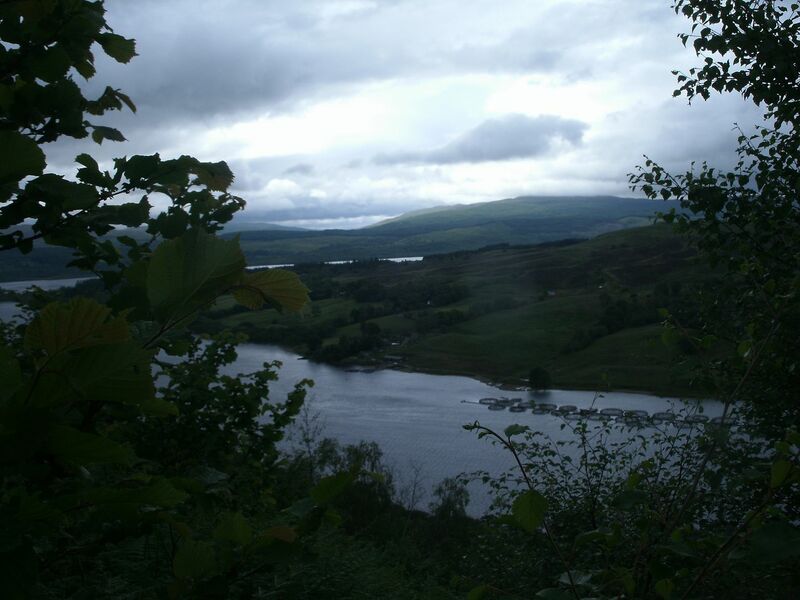 We must of missed the path, but its fine grassy walking so we headed for the mouth of the dam, and did find the path further on, but wished we hadn’t as it was pretty boggy and nae much fun. Once at the Dam, we decided to take the path the other side of the stream, and regretted it because although it is the path marked on the OS map, and therefore the one you would expect to be better.. It was a lot rougher in places, and my hopes of seeing the Cruachan falls were dashed – no views from this side either..
Oh well, a good hill to do in the clag, because there is so much interesting stuff happening at your feet, but I’ll definitely be back for this one again by a different route – Just a fabulous hill this! 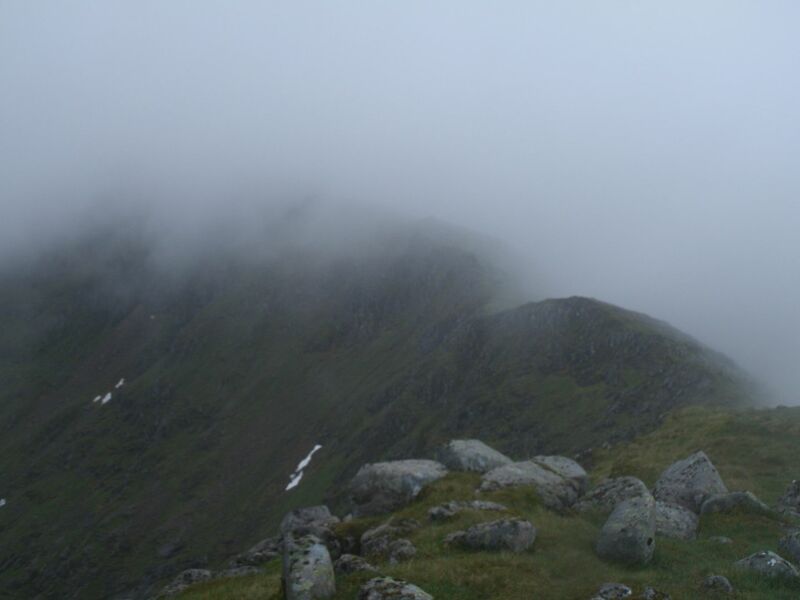 Nice, and your pics show me something of what I missed when I did Cruachan in a total shroud of mist and rain a couple of years ago, straight up,,not via the horseshoe. 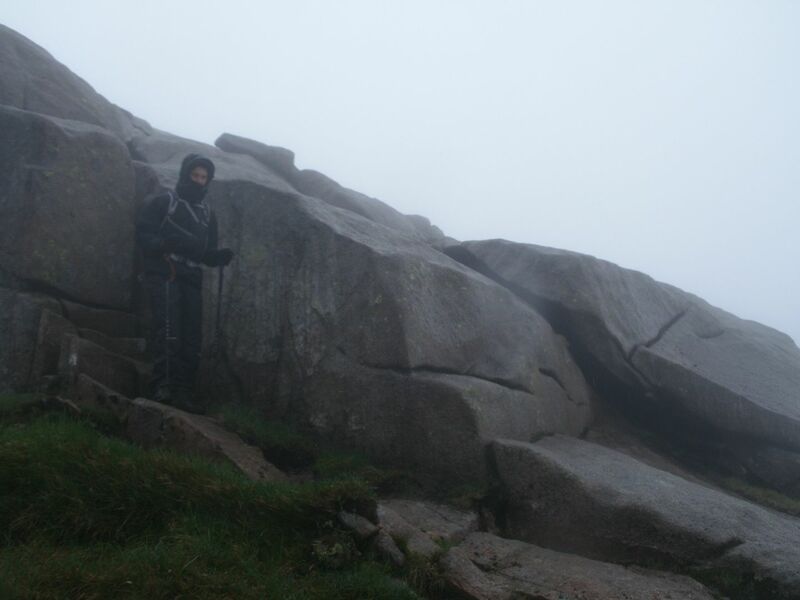 Thing is,,I don't remember a thing about it, a) cos I was being lead by someone who had the route etc all worked out and b)we couldn't see a thing, would love to get back up there and do the horseshoe route, with at least a smidge of visibility lol. 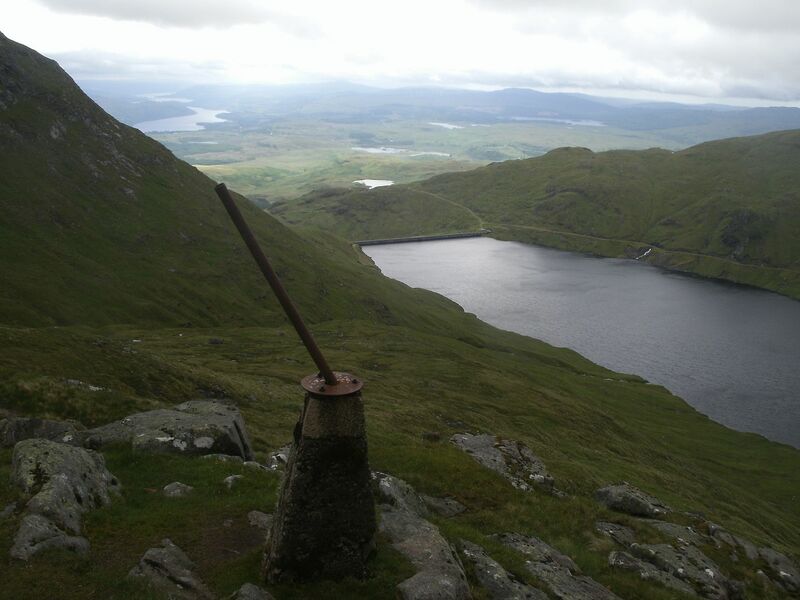 You may think it was a shame about the clag but it doesn't really matter to me - the hills will outlive me and there is plenty time to see them all again another time I'd rather weather like I had on Cruachan than the unbearable heat we have had of late anyways..